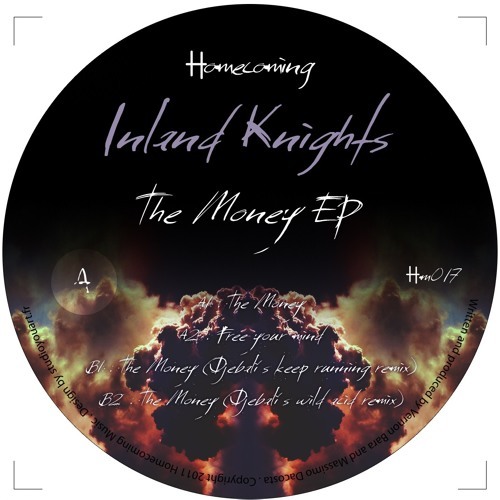 Inland Knights - The Money EP - Homecoming Music Release Date : 4th Jan. 2012 Ref. : HM017 For its last release Homecoming Music is more than happy to welcome one of the most prolific and respected production outfits in the House community : Inland Knights. The ‘Money’ EP embodies all the elements of exactly what Inland Knights has come to be loved for - an infectious fusion of groovy deep house with strains of funky tech vibes. Completing the package, Parisian emerging dj/producer Djebali takes on two remixes of title track, ‘Money. Djebali has been part of the Freak n’Chic crew for many years and has also released on Tuning Spork, Nordik Net, and his own ‘Djebali’ imprint. He delivered two deep and chunky awesome twisted fist versions that reveal the true sound of todays underground. All four tracks are sure shots for every music lover. Hope you enjoy !